Iatrogenesis (from the Greek for "brought forth by the healer") refers to any effect on a person, resulting from any activity of one or more other persons acting as healthcare professionals or promoting products or services as beneficial to health, which does not support a goal of the person affected. While some have advocated using the term to refer to all "events caused by the health care delivery team", whether "positive or negative", consensus limits use of iatrogenesis to adverse effects, including (in the broadest sense) all adverse unforeseen outcomes resulting from medication or other medical treatment or intervention. Some iatrogenic effects are clearly defined and easily recognized, such as a complication following a surgical procedure (e.g., lymphedema as a result of breast cancer surgery); less obvious ones, such as complex drug interactions, may require significant investigation to identify. Unlike an adverse event, an iatrogenic effect is not always harmful. For example, a scar created by surgery is said to be iatrogenic even though it does not represent improper care and may not be troublesome. Professionals who may cause iatrogenic harm to patients include physicians, pharmacists, nurses, dentists, psychologists, psychiatrists, medical laboratory scientists and therapists. Iatrogenesis can also result from complementary and alternative medicine treatments. Globally, as of 2013, an estimated 20 million negative effects from treatment occurred. It is estimated that 142,000 people died in 2013 from adverse effects of medical treatment, up from 94,000 in 1990. Iatrogenic conditions do not necessarily result from medical errors, such as mistakes made in surgery, or the prescription or dispensing of the wrong therapy, such as a drug. In fact, intrinsic and sometimes adverse effects of a medical treatment are iatrogenic. For example, radiation therapy and chemotherapy — necessarily aggressive for therapeutic effect — frequently produce such iatrogenic effects as hair loss, hemolytic anemia, diabetes insipidus, vomiting, nausea, brain damage, lymphedema, infertility, etc. The loss of function resulting from the required removal of a diseased organ is iatrogenic, as in the case of diabetes consequential to the removal of all or part of the pancreas. The incidence of iatrogenesis may be misleading in some cases. For example, ruptured aortic aneurysm is fatal in most cases; the survival rate for a ruptured aortic aneurysm is under 25%. Patients who die during or after an operation will still be considered iatrogenic deaths, but the procedure itself remains a better bet than the 100% probability of death if left untreated. Other situations may involve actual negligence or faulty procedures, such as when pharmacotherapists produce handwritten prescriptions for drugs. A very common iatrogenic effect is caused by drug interaction, i.e., when pharmacotherapists fail to check for all medications a patient is taking and prescribe new ones that interact agonistically or antagonistically (thereby potentiating or attenuating the intended therapeutic effect). Such situations can cause significant morbidity and mortality. Adverse reactions, such as allergic reactions to drugs, even when unexpected by pharmacotherapists, are also classified as iatrogenic. The evolution of antibiotic resistance in bacteria is iatrogenic as well. Bacterial strains resistant to antibiotics have evolved in response to the overprescription of antibiotic drugs. Certain drugs are toxic in their own right in therapeutic doses because of their mechanism of action. Alkylating antineoplastic agents, for example, cause DNA damage, which is more harmful to cancer cells than regular cells. However, alkylation causes severe side-effects and is actually carcinogenic in its own right, with potential to lead to the development of secondary tumors. In a similar manner, arsenic-based medications like melarsoprol, used to treat trypanosomiasis, can cause arsenic poisoning. In psychiatry, iatrogenesis can occur due to misdiagnosis (including diagnosis with a false condition, as was the case of hystero-epilepsy). An example of a partially iatrogenic condition due to common misdiagnosis is bipolar disorder, especially in pediatric patients. Other conditions such as somatoform disorder and chronic fatigue syndrome are theorized to have significant sociocultural and iatrogenic components. Posttraumatic stress disorder is hypothesized to be prone to iatrogenic complications based on treatment modality. The psychiatric treatment of some conditions and populations, such as substance abuse, and antisocial youths are regarded as carrying significant risks for iatrogenesis. At the other end of the spectrum, dissociative identity disorder is considered by a minority of theorists to be a wholly iatrogenic disorder with the bulk of diagnoses arising from a tiny fraction of practitioners. The degree of association of any particular condition with iatrogenesis is unclear and in some cases controversial. The over-diagnosis of psychiatric conditions (with the assignment of mental illness terminology) may relate primarily to clinician dependence on subjective criteria. The assignment of pathological nomenclature is rarely a benign process and can easily rise to the level of emotional iatrogenesis, especially when no alternatives outside of the diagnostic naming process have been considered. Many former patients come to the conclusion that their difficulties are largely the result of the power relationships inherent in psychiatric treatment, which has led to the rise of the anti-psychiatry movement. Meessen et al. used the term "iatrogenic poverty" to describe impoverishment induced by medical care. Impoverishment is described for households exposed to catastrophic health expenditure or to hardship financing. Every year, worldwide, over 100,000 households fall into poverty due to health care expenses. A study reported that in the United States in 2001, illness and medical debt caused half of all personal bankruptcies. Especially in countries in economic transition, the willingness to pay for health care is increasing, and the supply side does not stay behind and develops very fast. But the regulatory and protective capacity in those countries is often lagging behind. Patients easily fall into a vicious cycle of illness, ineffective therapies, consumption of savings, indebtedness, sale of productive assets, and eventually poverty. The 20th-century social critic Ivan Illich broadened the concept of medical iatrogenesis in his 1974 book Medical Nemesis: The Expropriation of Health by defining it at three levels. First, clinical iatrogenesis is the injury done to patients by ineffective, unsafe, and erroneous treatments as described above. In this regard, he described the need for evidence-based medicine 20 years before the term was coined. Second, at another level social iatrogenesis is the medicalization of life in which medical professionals, pharmaceutical companies, and medical device companies have a vested interest in sponsoring sickness by creating unrealistic health demands that require more treatments or treating non-diseases that are part of the normal human experience, such as age-related declines. In this way, aspects of medical practice and medical industries can produce social harm in which society members ultimately become less healthy or excessively dependent on institutional care. He argued that medical education of physicians contributes to medicalization of society because they are trained predominantly for diagnosing and treating illness, therefore they focus on disease rather than on health. Iatrogenic poverty (above) can be considered a specific manifestation of social iatrogenesis. Third, cultural iatrogenesis refers to the destruction of traditional ways of dealing with, and making sense of, death, suffering, and sickness. In this way the medicalization of life leads to cultural harm as society members lose their autonomous coping skills. It is worth noting that in these critiques "Illich does not reject all benefits of modern society but rejects those that involve unwarranted dependency and exploitation." Based on these figures, iatrogenesis may cause as many as 225,000 deaths per year in the United States (excluding recognizable error). An earlier Institute of Medicine report estimated 230,000 to 284,000 iatrogenic deaths annually. Evidence demonstrating the advent of pathological anatomy in 1823 Vienna (left vertical line) correlated with incidence of fatal childbed fever. The onset of chlorine handwash in 1847 is noted (right vertical line). For comparison, rates for Dublin maternity hospital, which had no pathological anatomy (view rates). Semmelweis 1861. 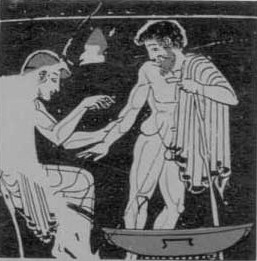 The term iatrogenesis means brought forth by a healer, from the Greek ἰατρός (iatros, "healer") and γένεσις (genesis, "origin"); as such, in its earlier forms, it could refer to good or bad effects. Since at least the time of Hippocrates, people have recognized the potentially damaging effects of medical intervention. "First do no harm" (primum non nocere) is a primary Hippocratic mandate in modern medical ethics. Iatrogenic illness or death caused purposefully or by avoidable error or negligence on the healer's part became a punishable offense in many civilizations. The transfer of pathogens from the autopsy room to maternity patients, leading to shocking historical mortality rates of puerperal fever (also known as "childbed fever") at maternity institutions in the 19th century, was a major iatrogenic catastrophe of the era. The infection mechanism was first identified by Ignaz Semmelweis. With the development of scientific medicine in the 20th century, it could be expected that iatrogenic illness or death might be more easily avoided. Antiseptics, anesthesia, antibiotics, better surgical techniques, evidence-based protocols and best practices continue to be developed to decrease iatrogenic side effects and mortality. ^ "Iatrogenesis | definition of iatrogenesis by Medical dictionary". medical-dictionary.thefreedictionary.com. Retrieved 15 February 2017. ^ "Iatrogenesis Medical Definition | Merriam-Webster Medical Dictionary". merriam-webster.com. Retrieved 15 February 2017. ^ Illich, I.; Hose, R. Medical Nemesis the expropriation of health. Elkrimbouziane. p. 1967. Retrieved 15 February 2017. ^ Kuhl, D. (2003). What Dying People Want: Practical Wisdom For The End Of Life. PublicAffairs. p. 55. ISBN 9780786725830. Retrieved 15 February 2017. ^ Coser, L.A. (1975). Idea of Social Structure, the. Harcourt Brace Jovanovich. p. 336. ISBN 9781412846967. Retrieved 15 February 2017. ^ "iatrogenesis - Dictionary definition of iatrogenesis | Encyclopedia.com: FREE online dictionary". encyclopedia.com. Retrieved 15 February 2017. ^ a b Jacobs JP, Benavidez OJ, Bacha EA, Walters HL, Jacobs ML (December 2008). "The nomenclature of safety and quality of care for patients with congenital cardiac disease: a report of the Society of Thoracic Surgeons Congenital Database Taskforce Subcommittee on Patient Safety" (PDF). Cardiol Young. 18 Suppl 2: 81–91. doi:10.1017/S1047951108003041. PMC 4242417. PMID 19063778. Retrieved 16 June 2014. ^ Finland M (1979). "Emergence of antibiotic resistance in hospitals, 1935-1975". Rev. Infect. Dis. 1 (1): 4–22. doi:10.1093/clinids/1.1.4. PMID 45521. ^ Llor, Carl; Bjerrum, Lars (16 October 2014). "Antimicrobial resistance: risk associated with antibiotic overuse and initiatives to reduce the problem". Therapeutic Advances in Drug Safety. SAGE Publications. 5 (6): 229–241. doi:10.1177/2042098614554919. ISSN 2042-0986. ^ Pruett Jr, John R.; Luby, Joan L. (2004). "Recent Advances in Prepubertal Mood Disorders: Phenomenology and Treatment". Current Opinion in Psychiatry. 17 (1): 31–36. doi:10.1097/00001504-200401000-00006. Retrieved 4 May 2008. ^ Abbey, S.E. (1993). "Somatization, illness attribution and the sociocultural psychiatry of chronic fatigue syndrome". Ciba Found Symp. 173: 238–52. PMID 8491101. ^ Boscarino, JA (2004). "Evaluation of the Iatrogenic Effects of Studying Persons Recently Exposed to a Mass Urban Disaster" (PDF). Archived from the original (PDF) on 25 June 2008. Retrieved 4 May 2008. ^ Moos, R.H. (2005). "Iatrogenic effects of psychosocial interventions for substance use disorders: prevalence, predictors, prevention". Addiction. 100 (5): 595–604. doi:10.1111/j.1360-0443.2005.01073.x. PMID 15847616. ^ Weiss, B.; Caron, A.; Ball, S.; Tapp, J.; Johnson, M.; Weisz, J.R. (2005). "Iatrogenic effects of group treatment for antisocial youths". Journal of Consulting and Clinical Psychology. 73 (6): 1036–1044. doi:10.1037/0022-006X.73.6.1036. PMID 16392977. ^ Braun, B.G. (1989). "Iatrophilia and Iatrophobia in the diagnosis and treatment of MPD (Morose Parasitic Dynamism)". Dissociation. 2 (2): 43, 161–2, 165–6, 171–2 passim. Retrieved 4 May 2008. ^ Meessen, B.; Zhenzhong, Z.; Van Damme, W.; Devadasan, N.; Criel, B.; Bloom, G. (2003). "Iatrogenic poverty". Tropical Medicine & International Health. 8 (7): 581–4. doi:10.1046/j.1365-3156.2003.01081.x. ^ Xu; Evans, DB; Carrin, G; Aguilar-Rivera, AM; Musgrove, P; Evans, T; et al. (2007). "Protecting Households from Catastrophic Health Spending". Health Affairs. 26 (4): 972–83. doi:10.1377/hlthaff.26.4.972. PMID 17630440. ^ Kruk; Goldmann, E.; Galea, S.; et al. (2009). "Borrowing And Selling To Pay For Health Care In Low- And Middle-Income Countries". Health Affairs. 28 (4): 10056–66. doi:10.1377/hlthaff.28.4.1056. PMID 19597204. ^ "Medical Bills Leading Cause of Bankruptcy, Harvard Study Finds". ^ Illich, Ivan (1974). Medical Nemesis: The Expropriation of Health. London: Calder & Boyars. ISBN 0-7145-1096-3. ^ Pearce, Wright (2003). "Obituary: Ivan Illich". The Lancet. 361 (9352): 185. doi:10.1016/S0140-6736(03)12233-7. ^ Barnet, Robert (2003). "Ivan Illich and the Nemesis of Medicine". Medicine, Health Care and Philosophy. 6 (3): 273–286. doi:10.1023/a:1025991708888. PMID 14620464. ^ a b Starfield B (July 2000). "Is US health really the best in the world?" (PDF). JAMA. 284 (4): 483–5. doi:10.1001/jama.284.4.483. PMID 10904513. ^ Leape L (May 1992). "Unnecessary Surgery". Annual Review of Public Health. 13: 363–383. doi:10.1146/annurev.pu.13.050192.002051. ^ Phillips DP, Christenfeld N, Glynn LM (February 1998). "Increase in US medication-error deaths between 1983 and 1993". Lancet. 351 (9103): 643–4. doi:10.1016/S0140-6736(98)24009-8. PMID 9500322. ^ Lazarou J, Pomeranz BH, Corey PN (April 1998). "Incidence of adverse drug reactions in hospitalized patients: a meta-analysis of prospective studies". JAMA. 279 (15): 1200–5. doi:10.1001/jama.279.15.1200. PMID 9555760. ^ Hanninen, O; Farago, M.; Monos, E. (1983). "Ignaz Philipp Semmelweis, the prophet of bacteriology". Infection Control and Hospital Epidemiology. 4 (5): 367–370. doi:10.1017/S0195941700059762. JSTOR 30142576. PMID 6354955.